Today Russian teams pass gomologization. Gomologization is a technical checkup of the robot on conformity to requirements of the international competitions. It has three items: static checkup, examine of the detectors and check of the movement. The static examination includes survey of the robot and its exact measurement. 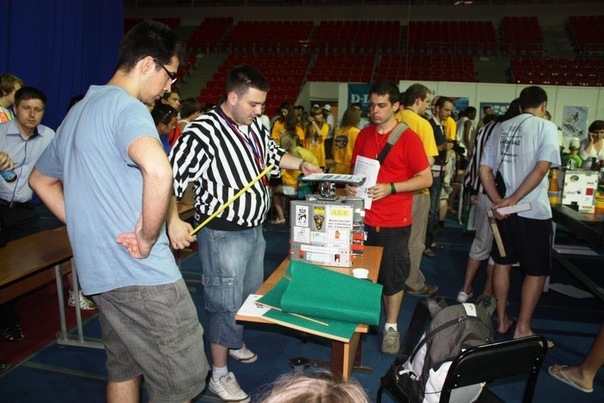 Judges verify the technical description with right of entrance: sizes of the robot, the prop of detectors, the rest equipment, and the obligatory equipment. One of the tables became the main. Judges checked of robots. Participants have shown strength of spirit even with judges. MGTU team entered hot discussion. The matter is that their robot was above norm on 2 ml. Participants of a command tried to mend the robot and measure something in other ways, but it couldn't help them. Despite of it MGTU team won the right to take part at the competition. At present Russian teams pass the following item of the gomoligization. At this stage the robot should already show movement on arena. It is very noisy and populously in the "Zvezdnii" sport complex today. There are 20 Russian teams and 40 foreign ones and they have to register and complete questionnaires. The participants are serious and stressful today. The team of Astrakhan State Technical University, named "Seltium" tells us about their impressions, their robot "Polar fox" is ready for playing chess. - We really have a difficult day tomorrow, because we have to defend diploma works before the championships. We worry about the competition because we have already determined the potential dangerous contestant for ourselves. This is a robot from France, it looks like a coffee machine. Moreover, we had only two months for preparation; it is our d?but at the "EUROBOT" competitions. We are looking forward to the arrival of all participants! The Hungary’s team has arrived by car. They passed 3 thousand kilometers. The team crossed over 4 borders. 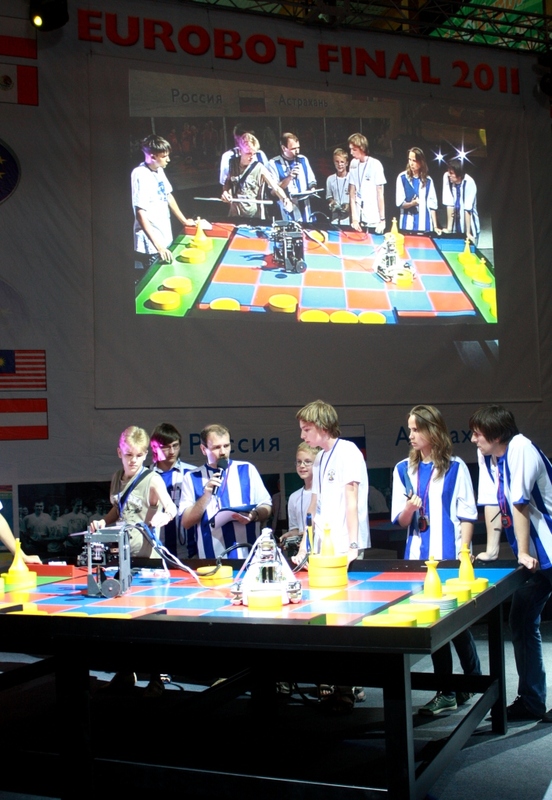 After completing robots' inspection of the Russian teams it was the turn of foreign teams. Team representatives with their iron pets at the moment conduct measurements (length, width and height of the robot should not exceed the metric in the competition rules) and testing at the playing field. Despite problems appearing in the process of inspection, teams are trying to fix errors, without departing from the playing field. 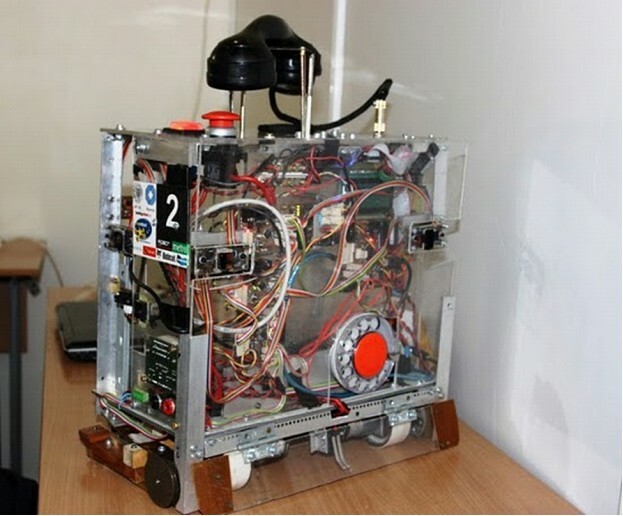 "Eurobot 2011" is a promising educational and experimental platform. Aim of the competition is to promote scientific and technical creativity among the young. It didn't take long to find talents in this area. In Astrakhan, for the final stage of the Eurobot competitions came participants from France, Belgium, Tunisia, Norway and other countries. A team from Germany "Rol Roboterclub Aachen eV" told us about their robotic wisdoms. - Why did you choose such a name for your team? - The name actually means a tough decision. After all, chess is sometimes difficult to decide where to put a figure - right or left. - How did you divide the work in your team during the project? - Each is busy with his own work - someone is responsible for mechanics, some - for electronics. Using such distribution of tasks you can quickly assemble the robot. The process is directed by our captain Georgi, he is the most experienced and organized team member. He's involved in the Eurobot competition since 2006. - Were there any victories so far? 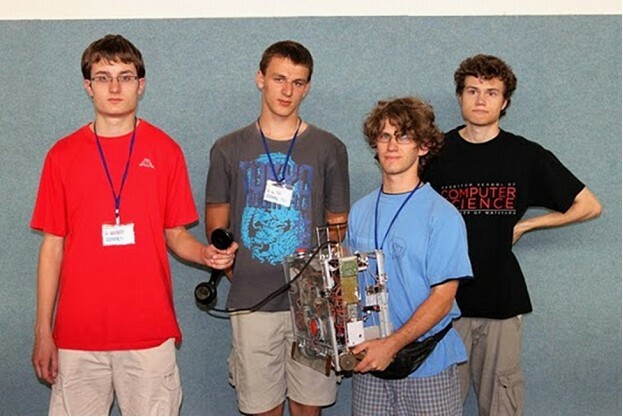 - Yes, last year we won second place for "Eurobot" in Switzerland. - Are there any advantages you see in your robot? - First of all, speed. Our robot is able to quickly move pawns. - Have you already defined the most dangerous opponent? - It is a team of our compatriots from Germany. Besides them, there are worthy competitors from France, their robot is impressive. - Does your robot have a practical value? - In general, we have made it specially for "Eurobot." But if it is improved, then it may well be used for autonomous assembly of machines, because it has sensors. - Do you think that robotics can be a good source of income? - Autonomous robots are now in little demand. But companies are interested in machines that can be used at home - vacuum cleaners and other appliances. - It is expensive to build such a robot. Do you have any financial support? - At home we have a club that works with universities. For example, the University of IAM allocates us a place to work, TI - equipment, etc. - Is this your first time in Russia? - Yes, here we are for the first time. We were surprised at how hot it is in here. We always thought that your country is very cold. - Do you have any worries before the competitions? - Now we are ok, we were afraid only for the robot's transportation. We heard that one team's robot did not get to Russia, someone had problems in the way ... We arrived safely, and our robot is already set up for excellent results. 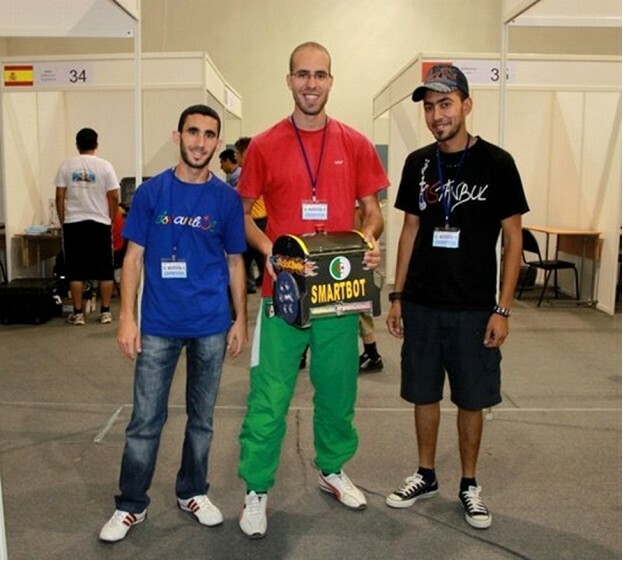 The team “Smartbot” from Algeria brought their robot, and this name for their robot they choose not accidentally. It's not just a metaphor. It has very important features such as agility, facility, simplicity and comparably small expenses for its production. They spend only 150 euro. Nevertheless, the team sure that their robot can compete on a high level. 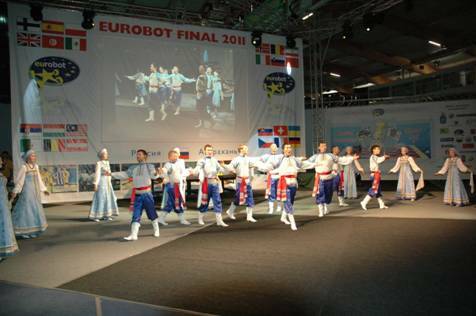 The competitors said that “Eurobot 2011” competition is their first international experience, but first of all they came to “Eurobot” for an exchange of ideas and cultural knowledge with participants from other countries. And, of course, the competition of such high level is a great experience for the young team of robotics. Before the participation in the competition of such high level the team from Algeria decided to try their hand in their country. And as the result they won. In March of 2011 the team took first place at the same competition in Turkey. The team “Smartbot” came to Astrakhan at the first time, and they never have come in Russia. Russia is a faraway country for them. They almost didn't know anything about Russia. The arriving in Russia was especially hard for them. It was the way Algeria - Roma - Moscow. But one of the team members has a girlfriend in Astrakhan, who helped them with buying of the tickets on a plane and also with useful information. The team is going to visit a few sightseeing such as Astrakhan Kremlin, Embankment and some of the museums. This line from a popular Soviet song describes best the events of this Astrakhan summer. “Robots work, not humans”. 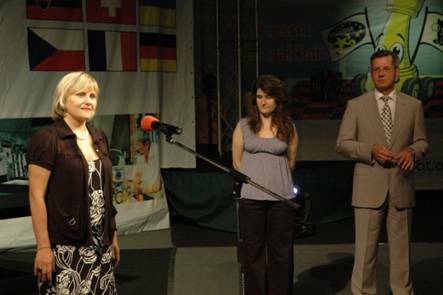 Grand opening of the scientific and technological event - the robotics contest “Eurobot 2011” took place at the sports center “Zvezdnyi”. The city of Astrakhan hosts international robotics teams from such countries as France, Germany, Italy, Morocco, Algeria, Tunisia, Belgium, Sweden, Ukraine, and also Russian teams. In his welcome speech the governor of the Astrakhan region Alexander Zhilkin noticed that development work of young robot builders has to find a practical application, and the contest “Eurobot” is an excellent starting point to enhance the professional capacities of engineers and designers. “Dear competitors of the “Eurobot” contest! Russia and Astrakhan region have chosen an innovative way of development. When 600 years ago Leonardo da Vinci made the first sketches of robots it was a mere fantasy at that time, but activities you're involved in now is reality which will provide a technological breakthrough”, highlighted the governor. President of nonprofit organization “Eurobot” Veronique Raoul shared some facts from the contest's history which started in France in 1998. The competition itself and the development of robotics has enjoyed a high degree of support from this country. As for Russia, it takes part in “Eurobot” for the 5th time. President of the Russian Association of Eurobot also gave a welcome speech to the competitors and guests of the contest. Symbolic greeting of robots and humans took place at the opening. Since the theme of the contest this year is chess, Alexander Zhilkin and Veronique Raoul made the first pawn move and the robot answered within several seconds. 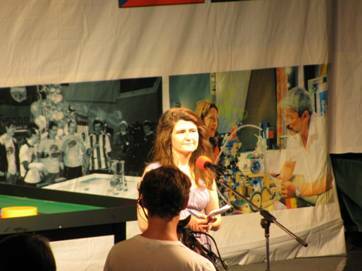 Creative ensembles from Astrakhan performed for the participants and guests of the “Eurobot” contest. Right after the grand opening of the "Eurobot" contest press conference with the representatives from national and European organizing committee of the contest and the Astrakhan administration took place. Journalists had a chance to get answers to their questions from Maria Salmina, president of the National Organizing Committee "Eurobot-Russia", Veronique Raoul, president of the European Association "Eurobot", Eugenyi Bazylev, head of the regional agency for youth, and Andrey Bakhmetiev, chairman of the board of the Russian association "Eurobot". Journalists were interested most of all in the reason why "Eurobot" takes place in Astrakhan this year. The idea of "Eurobot" is to involve more young people in the robotics and spread it around the world. That's why there's no single place for the final part of the competition. Russia has taken part in the contest for 5 years but only as a competitor. And this time Russia was ready to held the competition in one of its cities. Maria Salmina explained that there were several applications from different cities including the one from Astrakhan. Exactly this one attracted organizers' attention. Nowadays robotics in Russia isn't developed to the same extent as it is in Europe. An international tournament like "Eurobot" can be a good impetus to the further distribution of science and interest in robotics. Veronique Raoul fairly noticed that there are no losers in such events because everyone gets new knowledge and experience, and surely, makes new friends. Young team “Gymspit” from Czech Republic assured all of attendants that robots will rule the world very soon. This team participates in the “Eurobote” competition in the first time and they hope to gain valuable experience. The team didn't give a name to it's robot but they decorated it with interesting design. In his construction the robot has a phone handset on his top and on the one side it has a special embedded drum for the dialing of the number like on old telephones. So it can be distinguish from the other competitors easily. The team began the creation of this robot last fall and made it especially for the competition. University of this team helps them in participation in this competition. “Gymspit” team considers that the serious competitor is “Turag” team from Germany, whom they met at the Qualification match. Homologation of Russian and foreign teams started after the ceremony of the official opening of the contest. The competitors hurried up to the “playing” tables to pass the traditional procedure of receiving a permit to participation. However, some teams preferred not to go to such testing, but simply training on the field. So, homologation is a technical testing of robot's accordance to international contest's demands. Russian team “Voxel” decided to check its robot once again, because not everything was going well. It could take a pawn, but nevertheless it decided to put it near the furthest wall with which it faced. May be it is a result of other robot's presence. But the “going around” test was successfully coped by the robot. One by one both Czech teams successfully passed the testing. The most interesting one was the robot which is started up by receiver. The homologation will be going during 2 days. It means that the teams who have some problems with their robots can train them some more. Eurobot Junior Competitions of the first qualification took place. The Robots contest was quite serious, despite the age of the competitors. Unlike the projects of the main qualifications, these robots were controlled, but this fact doesn't (reduce the demand) reduce requirements for the teams. 5 teams took part in these competitions. The fight for the leadership was serious. Referees had to penalize some teams because they had forgotten the main rule of the competitions - spirit of friendship. After elimination rounds the referees counted the team's scores. Each robot took part in 2 rounds. Teams AD (490 points) and No brane, no game (390 points) left the competitors far behind, and won the first and the second prize accordingly. We congratulate not only the winners, but also all the participants of the competitions and wish them success and future victories! Andrey Bahmetyev who is a chairman of a tutorial council of Russian association "Eurobot" has held a game master class for children in the sports-center "Zvezdnii" during the "Eurobot 2011" competition. He has presented a series of electronic designers "Znatok" which was developed specially for interesting learning physics at school. Andrey Bahmetyev began to ask everybody why children, who were the most inquisitive people in the world didn't want to go to school. But children don't interest to study some technical disciplines because sometimes it is not clear, what for it is necessary, as well as that works and how is arranged. A lot of people come to "Eurobot 2011" from various countries, but communicate among themselves in English. The robotics for young men and children begins with studying of this language. After all, people can find more information about robotics on the English language. Therefore the dictionary of studying of English language has been developed for children, representing the book with images and speaking pen. When the pen concerns pictures in the dictionary, children hear a word's pronunciation. Children very liked this invention so much. For participants also there are another interesting inventions. The master class finished with focus which was shown by Andrey Bahmetev.